Product Description: This component is called the steering column assembly. It is a General Motors, chrome, 30 inch, tilt, with flasher, blinker, column drop, and electrical hook-up steering assembly. 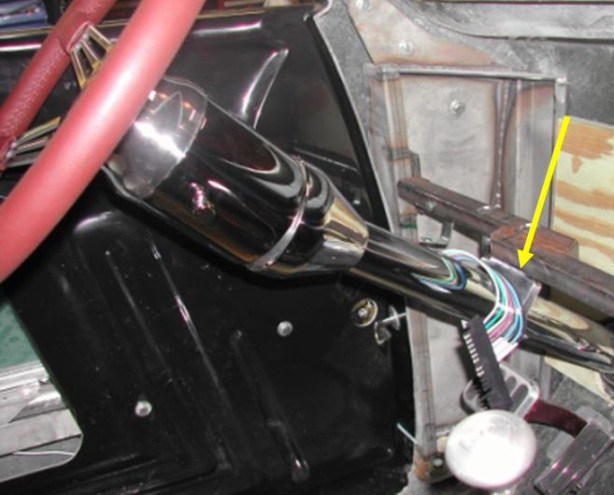 During installation, it is very important to install the steering column in the correct position. First it must be installed so that there is adequate support as shown by the column drop (see arrow). Also, the angle of the steering column must be comfortable for the driver. In addition, it must be positioned so that it doesn't interfere with the brake pedal or the throttle pedal. Also, make sure it is not too close to the driver's side door. It is recommended that before installing, make a model of the steering column with a pipe and piece of wood representing the 14 inch steering wheel. Try different positions, making sure the engine and exhaust manifolds will not interfere with the steering shaft going to the rack and pinion power steering assembly. Once the position is marked, a hole can be made through the firewall for further installation.